Seldom will you find an experienced networker who hasn’t once experienced the discomfort, fear and uncertainty you’re likely feeling (why else did you click on this post?) right now. You know the benefits of networking: the business opportunities, brand exposure, and knowledge sharing. But whether you’re a beginner or a seasoned networker, there can be a perennial feeling of ‘awkwardness’ that’s hard to ignore. As seasoned networkers ourselves, we’ve seen it all. 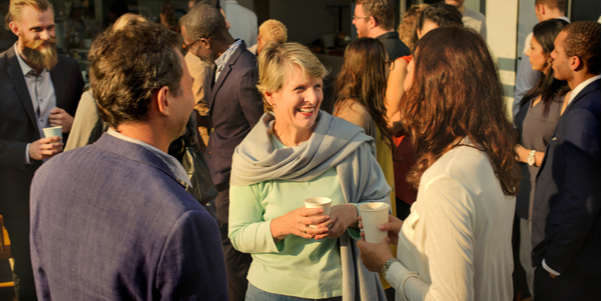 And we know from experience how to break down those 'awkward barriers' and enjoy the full advantages of networking events: valuable connections, insightful and stimulating conversations, and opportunities to grow your business. Put the following tips into practice and you’ll leave your next event feeling accomplished and confident. Sometimes, just the word ‘networking’ can conjure up all sorts of uncomfortable feelings. So try not to think of it as ‘networking’. Focus on the backdrop of the event instead. Will there be a presentation or workshop? Will there be a dinner? Will the event be held at a museum, or an art gallery? By switching up your thought pattern, you’ll start to get excited by the prospect of learning or visiting somewhere new. Language can have a huge impact on how we think. So when you speak to colleagues about the event you’re attending, refer to it as a presentation, seminar, or dinner. It is hoped that this little tweak will mask that awkward feeling of anxiousness you once had. Plus you’ll notice your own thought pattern begin to shift to one of excitement as you start thinking of this as an opportunity for growth. What are you hoping to gain from the event? Attending the event with an objective at the forefront of your mind not only helps shift your mindset, it also translates into how you approach others. For example, rather than arbitrarily pulling topics from the air, you can use your goal to break the ice and steer the conversion. But remember it's give and take. Can you provide value and help a peer meet their goal? You might not directly be able to provide value, but someone you know might. Think about how you can facilitate connections too - it might be reciprocated at a later date, but also, it’s nice to be nice. How you present yourself will have a direct impact on your confidence. As long as you're smart, presentable and comfortable, wear something you feel great in. Feeling confident and comfortable means you'll act more confidently and appear more approachable. It’s much easier to approach people in pairs than alone. When you think about it, a conversation between three people who have just met will inevitably flow better than a one-to-one. Plus, one half of that pair might be stuck in the encounter and willing someone else to come along and join the conversation. Use that to your advantage. Knowing the purpose of the event beforehand will help you gauge a better idea of the types of people who will be going. You’ll likely have access to an attendee list too, especially if the event has been promoted on social media platforms. Who is talking about the event? What are they saying? This can help you prepare conversation topics. Also, if there are speakers scheduled at the event, researching their topics beforehand will help you find common ground with your fellow attendees. Get to know the environment, grab a glass of water, pop to the loo, get some air. Arriving early will always work in your favour. It is far more difficult to break up existing conversations than to get into a flow before the crowds arrive. Humans are very perceptive and we feed off each other's energy. It’s been proven that your mood can impact how others around you are feeling. Something as simple as showing a smile can put others at ease and will make them more receptive to you. You don’t want to be carrying a wad of business cards all evening. Keep your hands free for strong handshakes and have a purse or pocket ready for business cards. Ever thought about hosting your own networking event, in the comfort of your own premises or familiar surroundings? A simple method is to invite 10 of your contacts and ask them to bring a friend or colleague. With so many people you know ready to introduce you to new people, they’re breaking the ice for you and in the process, you get to build that confidence. Yes, we mean queues for the drinks, food, a handout, or even the toilets. Simply the act of standing in line cries out for some sort of social interaction. In fact, it can sometimes feel more awkward not to. For that reason, look for opportunities to get in line and strike up some classic small talk. If you’re looking for an opportunity to grow your business and speak to some of the county's biggest buyers, register interest in our next 'Meet the Buyer.' Otherwise, we have a calendar of events which is regularly updated and open to members and non-members.